Originally released in August 1971, Who's Next became The Who's most acclaimed work and one of the most important albums in the history of rock. Springing out of Pete Townshend's never-fully realized Lifehouse Project, it revolutionized popular music by introducing the use of pre-programmed synthesizers and sequencing. 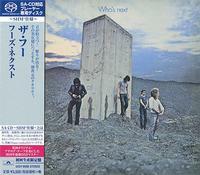 Who's Next also featured some of the Who's all-time biggest tracks, including "Baba O'Riley", "Behind Blue Eyes" and "Won't Get Fooled Again." The Who is my favorite rock band, and this is perhaps their greatest studio album (excepting Live at Leeds which is stunning). The music here is great. If you don't have this album in a format you love already, then this SACD is worth considering. The problem with this SHM-SACD is similar to about 70% of the other SHM-SACD releases I've purchased. It just sounds flat. This is not what this album sounds like. It is The Who at their most explosive. Even the video of the recording of Baba O'Reily on "The Kids are Alright" Blu Ray sounds better than this. It is almost as if there is a level of compression here that holds the sound back from it's normal impact. The Dynamic Range Database puts this SACD at between 9 (not great) and 11 (also not great.) There are recordings of The Who from earlier years such as Tommy and Quadrophonia, which both sound better. Anyway, this is a great album, but the sound of this SACD is less than optimal.